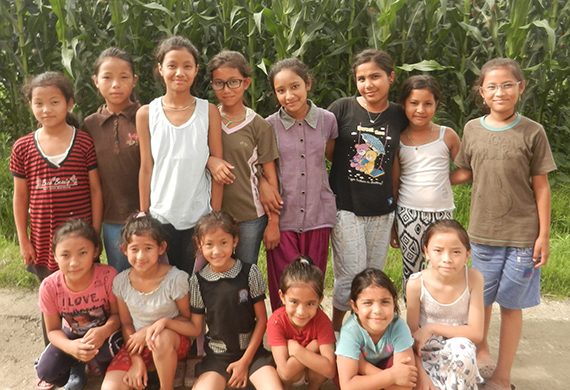 Our girl´s home, The Child Help and Care Center, is in Gokarna situated in the north-east of Kathmandu. The girls living here are aged between 7 and 17 and were previously street children. On 1 November 2014 we moved into a larger and more suitable house with a bigger bathroom and kitchen. This meant a huge improvement for the girls as well as the staff. The house came with a large field which will be converted into a garden. A playground has been installed and vegetables planted. We have a 5-year lease on the house. All the girls attend a private school where they are given considerably more teaching time than they would in a state school. They are happy there and look forward to their school days. They do very well and with excellent help from their teachers all of them gained a pass grade in all subjects. Several of the girls gained very high grades and have even been able to skip over some classes. This is even more amazing considering the fact that most of them never attended school before they came to us. The children will remain in our care until they have gained an occupational qualification or completed higher education. We will retain responsibility for them until they can provide for themselves and their future children. Our girls are hard-working, ambitious and have great plans for their futures. One wants to be a doctor, another a lawyer and a third wants to be an engineer. They have great dreams for their future working lives which gives us great satisfaction. It is confirmation that we are giving the girls hope for the future. The next step will be to make reality of their dreams and we believe that this is possible. These dreams will one day come true.